AUGUSTA, GEORGIA (October 25, 2013): Senator Hardie Davis, Representative Wayne Howard and Representative Earnest Smith will sit alongside a group of 4-year-olds on October 1st and 3rd, reading to the group from a favorite children’s book as part of Georgia’s Pre-K Week. Around the state, attention will be turned to the tens of thousands of Georgia’s youngest children in celebration of the important work they are doing to prepare for school success. September 30-October 4 is the state’s official Pre-K Week, hosted by Voices for Georgia’s Children (www.georgiavoices.org) and its Pre-K Week partners, such as the Junior League of Augusta. 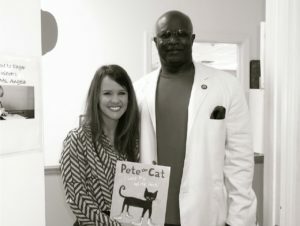 “We know that early childhood education is critical to future success, and preparing for elementary school is an important part of life for a child from birth through age five,” said Kari Baker, President of the Junior League of Augusta. “We are thrilled to participate in honoring some of our youngest learners this week,” Baker continued. Representative Smith will be at the GRU Child Care Center from approximately 9:00am – 10:00am on October 1st. Representative Howard will be at Glenn Hills Elementary School from approximately 9:30 am to 10:30 am on October 1st. Senator Davis will be at Lake Forest Hills Elementary School from approximately 10:00 am until about 11:00 am on October 3rd. While there, they will participate in a reading activity with the children, take a tour of the facility, talk with the staff, and get an up-close look at the many ways that the center is supporting early learning. Nearly 150 officials who will visit some of the approximately 3,800 Pre-K classrooms located in all 159 counties in Georgia. Joining Voices for Georgia’s Children as partners on Georgia Pre-K Week are Black Child Development Institute Atlanta (http://bcdi-atl.org), Ferst Foundation for Childhood Literacy (www.ferstfoundation.org), Georgia Association for Young Children (www.gayconline.org), Georgia Child Care Association (www.georgiachildcare.org), Georgia Early Education Alliance for Ready Students (www.geears.org), Georgia Family Connection Partnership (www.gafcp.org), Georgia Partnership for Excellence in Education (www.gpee.org), Georgia Public LibraryService (www.georgialibraries.org), JumpStart(www.jstart.org), Junior Leagues of Georgia – SPAC (gajlspac.org), Quality Care for Children (www.qualitycareforchildren.org), United Way of Metropolitan Atlanta (www.unitedwayatlanta.org) and YMCA (www.ymcaatlanta.org). Established in 2003, Voices for Georgia’s Children (www.georgiavoices.org) is a nonprofit child policy and advocacy organization that envisions a Georgia where children are safe, healthy, educated, employable, and connected to their family and community. Our mission to be a powerful, unifying voice for a public agenda that ensures the well-being of all of Georgia’s children. The Junior Leagues of Georgia, State Public Affairs Committee (SPAC) is the advocacy arm of the twelve Junior Leagues of Georgia, including the Junior League of Augusta. SPAC monitors state and federal legislation, and addresses important advocacy issues based on member League’s projects and efforts. SPAC has weighed in on various topics and has provided support to programs that benefit women and children across the state of Georgia. A s a collective voice SPAC represents over 10,000 women on issues concerning Education, Health, and Welfare to inspire change in Georgia’s communities. AUGUSTA, GEORGIA (October 3, 2013): The Junior League of Augusta, Georgia is proud to announce the recipients of its first ever Field Trip Fund. On Tuesday, October 1, JLA members awarded a total of $5,868 to surrounding area public schools for various educational field trips. The Junior League of Augusta Field Trip Fund is open to all public schools and provides funding to apply toward busses, drivers and admission to Richmond County museums or cultural attractions. The near-elimination of field trip and travel resources in public schools has caused a major reduction in field trips funded through the school system. The Junior League of Augusta is excited to help meet a need as we believe that field trips give students a freedom to explore, to think differently outside the classroom and the great sense of adventure. Congratulations to our 2013 – 2014 Recipients! Toni S. Kitchens North Columbia Elementary (Kindergarten – 59 students) Storyland Theater (Imperial Theatre) – Students will visit Storyland Theatre 3 times during the school year. Students will get to see stories they read in class and discuss the difference between the production and the story they read and discuss how the production is different from going to the movies. Ahsha Hayes North Columbia Elementary (1st Grade – 50 students) Storyland Theatre – Students will attend Storyland Theatre’s production of Hansel and Gretel. Students will be able to experience a theatre production. Lynn Carwell Blue Ridge Elementary (4th Grade – 108 students) Downtown Augusta: Arts and Academics – Students will see the musical “School House Rock! Live” at the Imperial Theatre performed by the Augusta players. This musical combines hip music and catchy lyrics to teach lessons in American history, rules of grammar, multiplication tables, science, government and finance. Students will also visit the Morris Museum of Art for a tour of the museum with a focus on the integration of mathematics and visual arts. Finally, students will engage in a workshop creating a radial design drawing which will incorporate art and math. Students will also complete a language arts writing assignment so that they may enter the Morris Museum’s Combining Voices literary competition. Tom Crow Evans High School (Grades 9-12 – 72 students) Morris Museum of Art – Students will view the glass artwork by R. Jolley and T. Rush, and the Wells Fargo Bank Collection along with current permanent collection in the museum. Students will also write a poem or short story to enter the Literary Competition being held by the museum. Students will be starting a unit on Life Changing Experiences on October 9, and three of the short stories or poems which they will be reading and analyzing during the unit are “The Raven,” “The Tell-Tale Heart,” and “The Monkey’s Paw” by Edgar Allen Poe. The Chamber Theatre is performing those three stories along with three other acts on October 22. Students will be able to see the performances that they are reading about. Students will be able to experience a live performance that will help them to be able to grasp a full understanding of the stories and their themes and will enhance classroom discussions of the stories. Mary Cleary Columbia Middle School (7th Grade – 345 students) Grant will be used for scholarships for students who need admission costs Diary of Anne Frank play – Students will read The Diary of Anne Frank and will analyze the play for literary and historical values. They will then attend a performance of the play at the Imperial Theatre. Most students have never been to a live play before, so this will be not only a good learning experience, but a valuable one. Students will learn the literary value of the play and be enriched by seeing a live performance of a play. Carly Gilchrist Craig-Houghton Elementary (2nd Grade – 70 students) Storyland Theatre – Students will attend 3 performances during the school year. Performances will include original plays, familiar fairytales, puppetry and musicals.